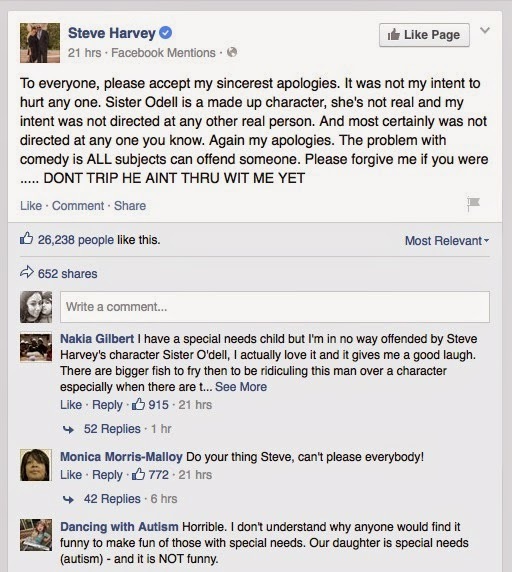 Steve Harvey, another celebrity who thinks it’s okay to use individuals with special needs the punch to his joke. The joke was made during his morning talk show on March 26th and Harvey has since apologized on his Facebook & shared via Twitter. But I’m not impressed with his apology. Not in the least. Because it’s not really an apology…he’s not really owning his words. And I don’t believe he thinks he did anything wrong. It was not my intent to hurt any one. Sister Odell is a made up character, she’s not real and my intent was not directed at any other real person. And most certainly was not directed at any one you know. Again my apologies. The problem with comedy is ALL subjects can offend someone. He’s passing the buck and blaming the character, rather than himself. And then he says that comedy offends everyone. That’s not really true. You can be funny without having to use special needs and/or disability as your punch line. “Not directed at any one you know” That attitude right there is the problem sir. Because it seems you feel that the only folks that MAY be offended are the ones that have a special needs child. Or that you are protected by the “laws of comedy.” Because next month is Autism Awareness month and I suspect you will slap on a puzzle piece lapel pin or rerun your show where you had some autistic child on it being adorable. Don’t tout us out when you need it and then throw us under the bus when you are lacking material for a skit. Oh sure there have been comedians, celebrities and rappers who have used the r-word and made fun of individuals with special needs before. But I think my biggest issue is that the joke came from Steve Harvey. Steve Harvey. Let’s talk about him for a moment. His Twitter bio is: Proud husband, father, comedian, daytime show host, philanthropist and author. God has blessed me with more than I could have asked for! He has 2.73 million followers on Twitter. Steve Harvey’s Facebook page has 3,244,752 likes – he is listed as a public figure. The Steve Harvey TV Facebook page has 3,027,252 likes. Steve Harvey is also a NY Times Best Selling author. He’s also part of the Coca-Cola Pay It Forward Campaign – to nominate teens win a college scholarship. And Steve Harvey is black. Autism among minorities specifically African Americans and Latinos is often diagnosed later (after four years of age). There is still so much stigma within our community about autism and intellectual disabilities. Children are being bullied at school and in the playground due to lack of understanding and ridicule. And if someone like Steve Harvey – the loving husband, father, philanthropist, the church goer – can make fun of individuals with special needs, it throws the door wide open for anyone else to do the same. I love to laugh. Sometimes I need to laugh. I look for the humor in our day-to-day because it’s the laughter that gets me through the worry. And Steve Harvey is capable of making so many laugh. But like that mom said – this is my life. Living with special needs is our life, and the lives of so many families. We are real. We ALL fall short of the glory of God. Steve Harvey too. He is man not God. He has said several times he is not perfect. Thou without sin cast the first stone. If he said he is sorry what else can he do? That's all he can do. Since God has forgiven him, that's all that matters. People need to stop idolizing Steve Harvey. He is a man a human being, not God. So that means he is not perfect and never will be just like every other human being on this earth now, in the past, or in the future. So stop condemning him. 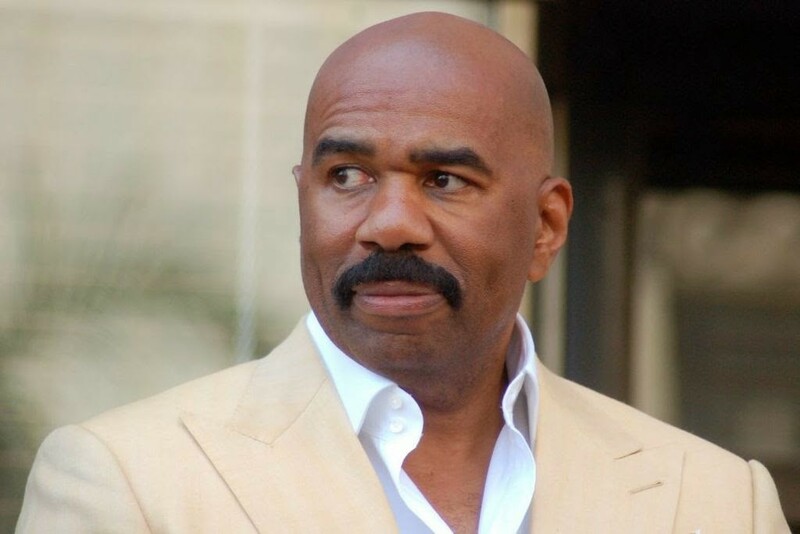 I don't idolize Steve Harvey, let's get that straight. I just know that Jesus is forgiveness. How can anyone condemn Steve unless they are perfect themselves. No one is. So stop. Focus on God and not the cares of this world. But as brothers and sisters shouldn't we support one another in understanding and awareness? Shouldn't we speak up and say, that went too far, that hurts, you went too far? I think what hurts the most about Steve Harvey doing this is because he knows this hurt, he knows this exclusion, he knows this pain of being made the lunch line based on how he looks or acts. When we hurt one, we hurt all. And conversely when we help one, we help all. Lets help each other not by throwing the stone but by taking the stone way from the person who threw it and explain why it hurts. Steve Harvey has a great opportunity to set the example of true respect for ALL people. I believe he can. I believe we should encourage him to reflect and truly make retribution to those he has hurt. No one has confused this man with God or said he was perfect. Are we NOT to speak up when someone says something hurtful? We're just supposed to shut our mouths and smile? I WILL care about this world I live in and I WILL work to make it better for my child who is non-verbal who tries so hard to communicate. We need to accept people for how they are born and who they are. His attitude towards the subject matter shows he is naive of people with developmental disabilities. They are not a subject to be laughed at. Their attempts at communication should not be made fun of. They are simply people who are different. That is ok. Let us love and accept everyone as they are. Mr. Harvey!!!! I invite you to come spend one day with our family. No camera's, no interview for a show, no suits, just you….. After you have spent the day. I would like to know your thoughts at the end of the day if you still find it ok to make jokes……. Agreed! It's never "OK" to target some of the least vulnerable in our society for some laughs. And whether or not Steve Harvey said it wasn't directed to a real person or not that wasn't the point. As a public figure he needs to Learn to exercise better judgment as the things he says, in or out of chararacter, can impact many. That was simply done in poor taste. From what I remember, Steve Harvey makes fun of a lot of people. She said she was a fan until he was making fun of a person who was close to her. So, when he was making fun of other types and groups of people was okay? She was a fan until it hit close to home. It smells a bit like hypocrisy to me. People don't seem to be consistent with their gripes in regards to who people are making fun of, but that's my personal opinion.